For the second year in a row and for a third time since its inception, Indiana State University was one of 112 colleges and universities earning recognition on the 2013 President's Higher Education Community Service Honor Roll with distinction. Indiana State is the only public institution in the state listed in that category. The level of recognition for ISU matches that of 2006, the first year of the Honor Roll program, and 2012. The President's Honor Roll recognizes higher education institutions that reflect the values of exemplary community service and achieve meaningful outcomes in their communities. An estimated 11,400 ISU students provided 1.2 million hours of community service through volunteerism, internships, service-learning and related activities in 2011-12 according to Indiana State's Honor Roll application. College students make a significant contribution to their communities through volunteering and service, according to the most recent Volunteering and Civic Life in America report. In 2012, 3.1 million college students dedicated more than 118 million hours of service across the country - a contribution valued at $2.5 billion. "We are pleased Indiana State has been recognized with distinction on the President's Honor Roll for the third time," said university President Dan Bradley. "Seeing and hearing about the difference our students, faculty and staff are making in the lives of so many people is the best reward of all." While Indiana State has a history of community engagement, the university is working to more fully connect service learning to academic learning. Faculty assessments for promotion and tenure now consider experiential learning and community engagement and academic majors are required to incorporate service learning. "Our commitment to service is limitless," said Nancy Rogers, associate vice president for community engagement and experiential learning. "It can be found within our classrooms, student organizations, athletics, residence halls and the Greek community. The true hallmark of a Sycamore is serving the community, whether it's in West Central Indiana, the State of Indiana or beyond." Students' community service work ranged from disaster relief and cleanup in Henryville, assisting 30 non-profit organizations within Terre Haute during Donaghy Day activities to health care and social work outreach. Students are also involved in economic development by assisting new and expanded businesses and educational outreach through programming at the Terre Haute Children's Museum and assessment and treatment for communication disorders through the Bayh College of Education's Rowe Center. Indiana State's partnership with the Ryves Neighborhood provided Indiana State faculty, staff and students with a variety of engagement opportunities, ranging from healthcare, neighborhood cleanup, working with children at the Ryves Youth Center and helping those in need. Athletic training and physician assistant students working at St. Ann Clinic expanded rehabilitation services while the university collected three tons of food to stock shelves of the Catholic Charities Food Bank. Sycamore volunteers lead activities, tutoring and mentor the children at the center, donate school supplies and holiday gifts and assist the Center with various other projects. Indiana State also provides instructors for the Center's Preschool program. But Indiana State is also making a difference beyond the Wabash Valley, said Rogers. Indiana State's faculty, staff and students are actively engaged with Special Olympics Indiana, working in their official capacities as well as volunteering at the State Basketball Tournament and Summer Games. The university partnered with Special Olympics Indiana and Indy Parks and Rec for the Eunice K. Shriver Indianapolis Day of Service. Seventy-eight volunteers from Indiana State and Special Olympics Indiana helped spruce up Garfield Park in Indianapolis, a Special Olympics training site. Students, faculty, and alumni worked alongside Special Olympics athletes and their families to mulch around trees, edge grassy areas, clean and paint park structures. They will partner again on April 20 for the third annual Indianapolis Day of Service. 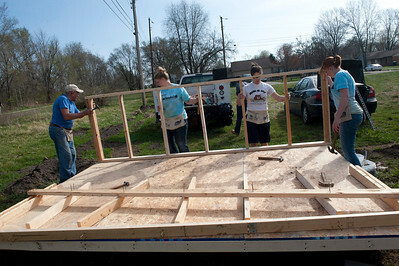 Indiana State coordinated three trips to assist tornado-ravaged victims of Henryville, in addition to sending students to complete Alternative Spring Break projects throughout the country. The Corporation for National and Community Service oversees the Honor Roll in collaboration with the U.S. Departments of Education and Housing and Urban Development, Campus Compact, and the American Council on Education. Honorees are chosen based on a series of selection factors, including the scope and innovation of service projects, the extent to which service-learning is embedded in the curriculum, the school's commitment to long-term campus-community partnerships, and measurable community outcomes.